In early 2018, I penned a post which illustrated the legendary Bob Farrell’s 10-investment rules. Bob, one of the great investors of our time, had a very pragmatic approach to managing money. Investing rules, and a subsequent discipline, should be a staple for any investor who has put their hard earned “savings” at risk in the market. Unfortunately, far too many invest without either which leads to less than desirable outcomes. As of late, there has been a lot of excitement over two areas of the market in particular: interest rates and oil prices. In fact, at this moment the speculation in these two areas is at record levels. First, the speculation that oil and interest rates will go higher are the two areas which have the greatest negative impact on economic growth and earnings. Rising interest rates increase borrowing costs and higher oil prices increase input costs for manufacturers. 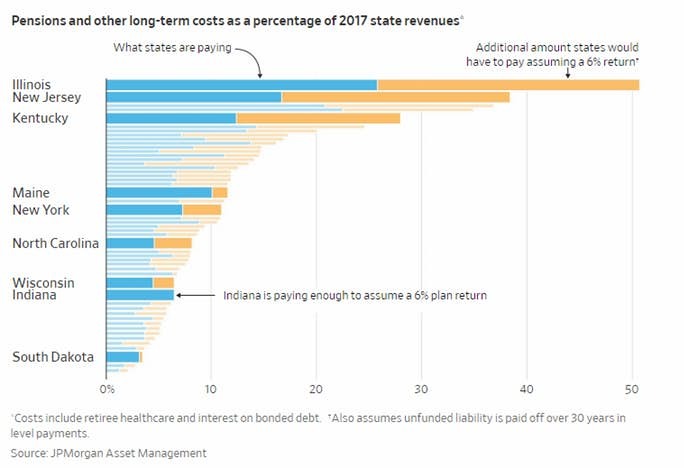 As I noted previously, with a heavily indebted consumer, there is little ability to pass on higher costs which, if absorbed, reduces profits. Rule #9: When all the experts and forecasts agree – something else is going to happen. Currently, when it comes to oil prices, there is little room left for more bullishness. 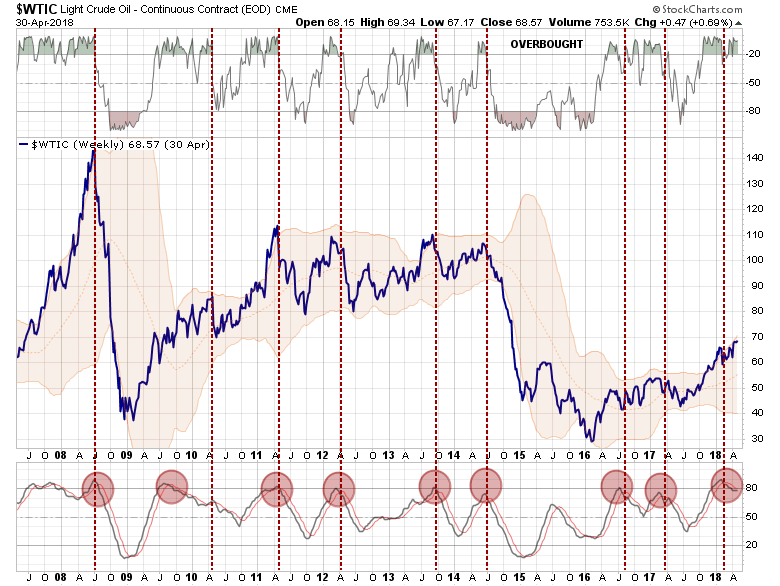 As oil prices have risen due to concerns over the potential supply concerns from geopolitical tensions, the price of oil is now as overbought and extended as at every other prior peak. Of course, the cycle of rising oil prices leading to increased optimism which begets bullish bets on oil continues to press prices higher. However, it is also the exuberance which has repeatedly set up the next fall. As shown below, bets on crude oil prices are sitting near the highest levels on record and substantially higher than what was seen at the peak of oil prices prior to 2008 and 2014. “The sharp increase in oil prices over the past month has been accompanied by a further rise in spec positions, which as JPMorgan notes, has now risen to new record highs. This suggests that hedge funds and other speculative investors have been at least partly behind the recent sharp spike in oil prices. As JPM further notes, both Systematic and Discretionary hedge funds have been building up long positions in oil, with the former induced entirely by momentum and positive carry, while the latter have rushed in due to geopolitical issues, continued inventory declines in the US and expectations of Saudi Arabia engineering a higher oil price ahead of privatizations next year. Bloomberg confirms the recent surge in commodity fund inflows, noting that hedge funds investing in oil are luring capital at the fastest pace in more than a year. After years of pain, commodity funds have recovered the client outflows they suffered last year. According to eVestment data, investors allocated $3 billion to commodity-focused hedge funds from January through March, the most since the third quarter of 2016. The last paragraph is problematic as retail investors are always “late to the party.” From a contrarian standpoint, this alone should be worrisome. However, with speculators pushing prices higher, the economics of the cycle are very mature. Higher prices has led to a surge in production to an all-time record. However, demand, which has started to deteriorate over the last 12-months, remains stagnant and more representative of the economic demand-driven side of the equation. With oil, a direct cost to consumers, the surge in prices acts as an additional tax on consumers which detracts from other economically sensitive discretionary purchases. 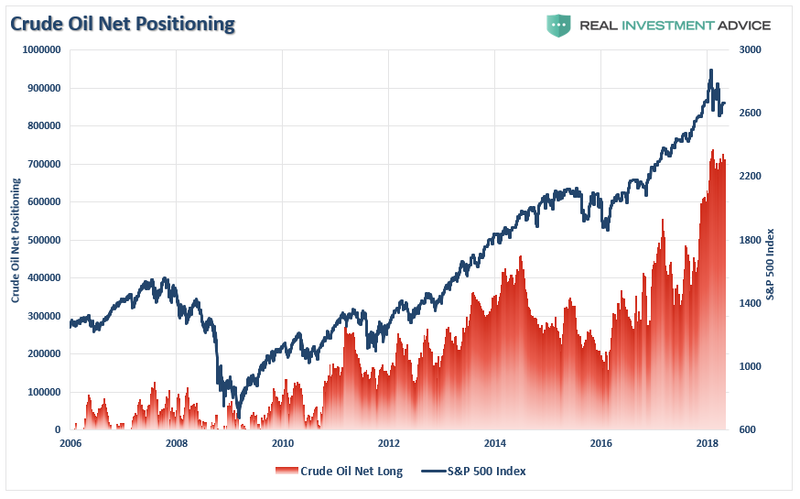 With production at records, along with net speculative long-positioning by investors, the risk of a reversion caused by an economic slowdown or recession is problematic. This is where the second “overly crowded trade” comes into play. The rise in commodity prices, combined with the Fed’s instance on hiking interest rates, has led to a belief that demand-driven inflation is finally set to return to the U.S. 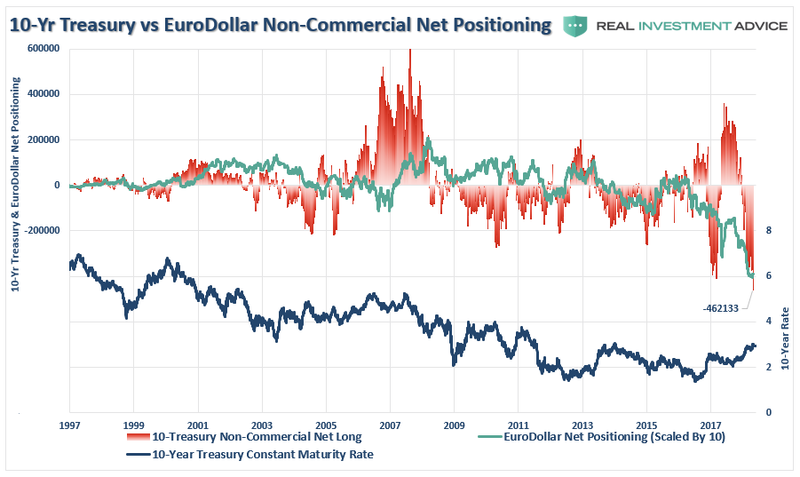 This has led speculators to build the largest net-short positioning in U.S. Treasuries on record. Once again, we see Bob Farrell’s rule in action. Previously, such record net-short positioning has been more indicative of peaks in the interest rate cycle as opposed to the beginning of higher rates. You can see this more clearly if we strip out all of the positionings except those periods where net-short contracts exceeded 100,000. The problem is the tentative rise in inflation is driven by higher costs being pushed onto consumers. This is the wrong type of inflationary rise which negatively impacts economic growth. As opposed to rising prices driven by rising demand, cost-push inflation simply eats away at discretionary incomes reducing consumptive spending which is 70% of economic growth. 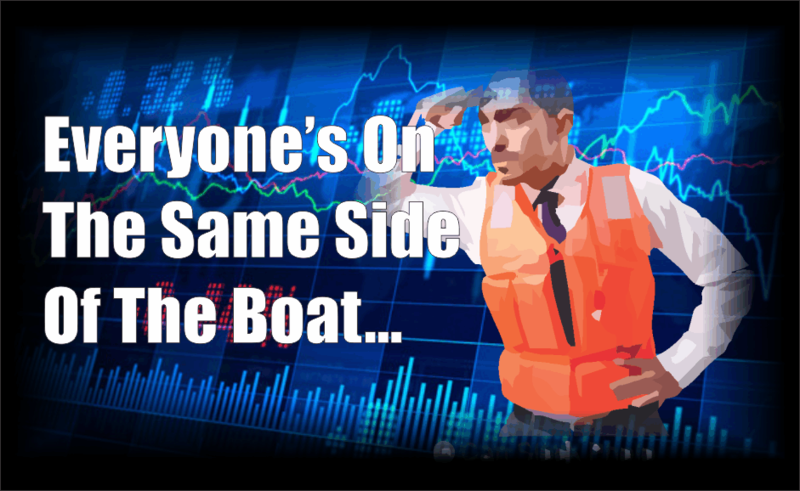 With positioning on the U.S. Dollar net-short, along with interest rates and the Eurodollar, there is plenty to suggest that traders, and investors, have all rushed to the same side of the boat.